Our web marketing methodology is an organization strategy to give structure to your business marketing that is actionable, accountable, and focused on growth. Contact us about developing a marketing plan for your business. Whether you are interested in enlisting us as your marketing muscle or looking for a structure to organize your online marketing into a cohesive and accountable plan, below is an outline of our practical approach of organizing and developing an online marketing campaign. Other websites like fan forums or government sites are built for information and communication between like-minded people. Their success is only as important as their users – they exist because others need them to, or want them to. 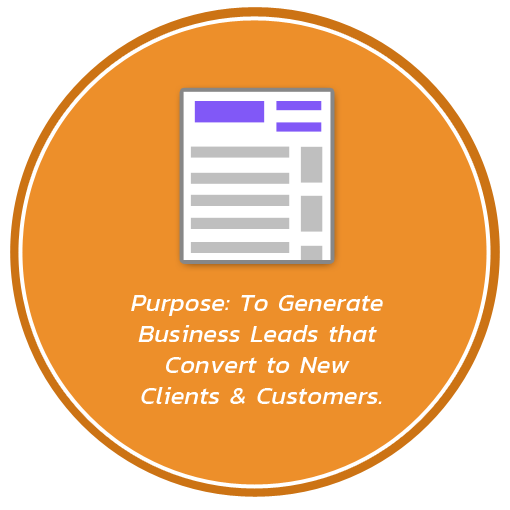 Each of these objectives are part of the sales process sharing a common thread – they connect your customer with your product. How you find them, how you get them to take action, and how you communicate to build the experiences and reputation for others to do business with you again and recommend others. Everything that follows will be tied to one of these three big objectives. Each one depends on the another. For instance, no amount of Website traffic will matter if your visitors cannot take action. Consequently, sales conversions are only short-term achievements and will matter very little if customers do not come back or recommend you to others. Each objective has quantifiable goals. Some companies call these metrics Key Performance Indicators (KPIs). Measuring performance is important so you can know what aspects of your marketing are most effective and which ones need work. Your Key Performance Indicators should always be tied to one of the three core objectives and tracked across any time period that suits short-term and long-term goals. (Hourly, daily, weekly, monthly, yearly). Anything you do to find new business. Anything you do to call people to action, whether this be to call you, complete a web form, or purchase a product. Any activity to connect with your customers, including customer support and getting feedback. To the left is a big, swirling mess of some popular marketing brands, tools and services. You probably recognize at least a few of them. Protocol Three uses many of these services; some of them, like Google, are almost unavoidable if you want to compete online. Before I answer that question, we’re not going to do anything with these brands -specifically – just yet. Many will matter. With so many options, it’s not difficult to see why many business owners quickly become overwhelmed. Let’s put this soup bowl of colorful logos into perspective! 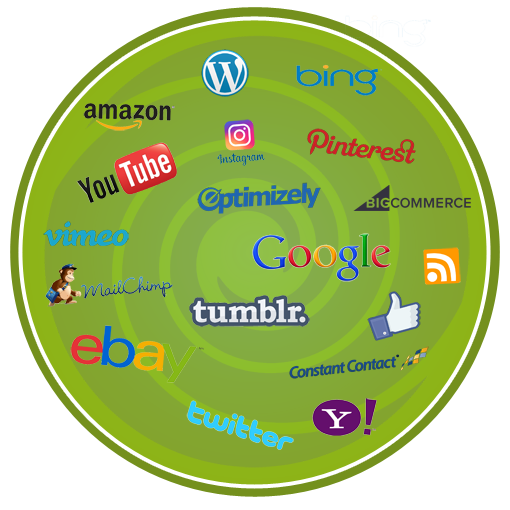 All of these brands have specialized tools and services for online marketing tactics. Youtube sells video advertising (reaching people), Optimizely sells A/B testing (sales conversions), Mailchimp and Constant Contact are email delivery services (reaching people and/or customer communications), Facebook and Twitter are social media sites with some level of advertising potential (reaching people and/or customer communications), Bigcommerce is an e-commerce platform for selling online with several built-in marketing tools (reaching people, increasing sales conversions AND customer communication). 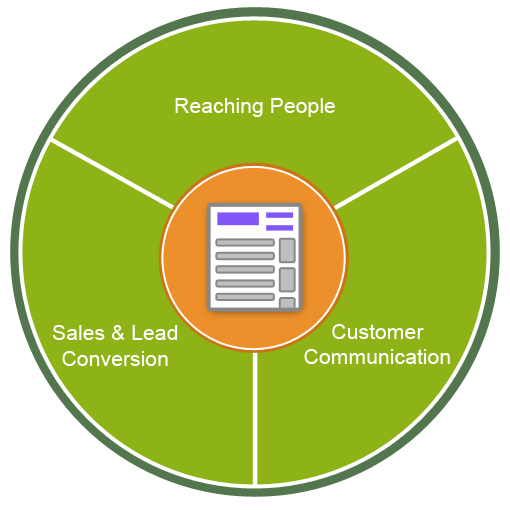 The objectives from step 2 and 3 are the “What” you aim to achieve in marketing. Tactics are the “How” to achieve them. How will I market this business to reach my objectives? To be clear: Tactics are not something you “do”. Someone may say they’re “doing SEO”, just as someone may say they are “doing car repairs”. SEO encompasses many actions: leveraging tools and services to perform keyword research, fix website code, develop sitemaps, write page titles, and build links. All of these activities are “doing SEO”. What’s really important is the effectiveness of SEO. SEO is one tactic in your marketing arsenal that can be measured independently for its effectiveness, and that is exactly the point! Next, we organize these tactics up into one or more of the Objective groups based on what is being measured. Smart planning means knowing what is working and what is not. Your business strategy is a balancing act of time, budget, and effectiveness. You want to always put your effort where it matters most. Measuring performance of marketing tactics allows you to systematically eliminate waste and focus on the tactics that growing customers and profits. For example: you have a Google Adwords campaign. You find advertising takes up 50% of your marketing budget but only brings in 20% of the new customers and revenue. By tracking customer acquisition and profitability of this advertising, you’ll know it makes sense to move marketing dollars to scaling up the more effective tactics while adjusting Adwords campaigns to reach the Goldilocks “Just Right” balance of spend, involvement and profitability. Tactical goals are quantifiable, track-able data that can be used to measure effectiveness and improvements over time. Tactics may share the same goals as the business objective, but they usually have more specific goals to see just how effective that tactic is to growing your business. For example: you find that newsletters prove a useful marketing tactic for your business. There are endless ways to improve it: tracking opens, newsletter referrals to the site, and testing the best time of day to send it are all specific attributes to improving an email campaign. Once you’ve decided on your marketing tactics and the tools and services you’ll use to apply them, you’ll need to brainstorm a list of activities that are actionable, quantitative and focused on achieving the objectives. Activities are the “DO” of your marketing plan. These are often too numerous to mention; it is here where the real knowledge and experience of Protocol Three comes into play. We have the knowledge and expertise to create a cohesive plan that utilizes your working budget, and then execute a plan that throws your weight where it counts. We save time and money by applying our expertise with the right tools in a purposeful way both short-term and long-term. Marketing is an ongoing operation. To achieve growth, you must have the right information to make effective decisions. In fact, making decisions is the ONLY useful function for measuring your marketing. And it’s crucial – without the facts, you’re only making a guess. Protocol Three has extensive experience in long-term relationships with clients to maintain and help make good marketing decisions. We’re a trusted liaison for several businesses, operating as an in-house equivalent business partner.